Air-conditioned, Sunny and spacious, free Wifi, Perfect location to unwind ! Fifth floor entire apartment with elevator. Balcony with country views of Mellieha valley topped by blue skies and Mellieha Parish Church on the horizon. Gets the sun and is ideal for getting a suntan. The apartment enjoys some seaviews form two of its back bedrooms and is just a 5 minute walk (300m) from Mellieha's main sandy beach. Our apartment location is central with Shops, Bus Terminal, cafes, restaurants, pools, beaches all within a few minutes walking distance. The year of purchase was a magical one, we had just paid off the loan on our home and we went recklessly headlong into another mortgage ..... so it was back to bread and cheese with no time for cake in between. But it was a purchase I do not regret because my family built so many happy memories and now I hope that the apartment will go some way in helping you too to enjoy our beautiful island and build warm memories of a happy Mediterranean holiday. I purchased this property because its a great location both in summer (beach) and in winter (calm coastal walks). In summer our children loved the freedom of the safe, sandy beach. There are no under-currents here and its a short walk to the beach ..... generally just long enough for them to eat their ice cream on the way back. And there are several cafes and restaurants which are children friendly and reasonably priced in the area so eating out was a welcome treat for tired parents. The Riu Seabank hotel has a free play area, the Danish Village do a great luncheon buffet, Ta Peter has good food and our all time favourite is the cafe behind Mellieha Church with its stunning views and public playground. On the beach, there are deck chairs and umbrellas for rent or you can just throw down a towel and let the children get on with playing in the sand and splashing in the sea. In winter the area is a quiet one. Its ideal for tranquil pursuits such as a picnic on the beach, or painting the ever changing scenery or walking to the Bird Sanctuary located on the main road about 800metres from the apartment. Our children still love the beach in winter even now they're in their teens; they fly kites or kick a ball about. Theres nothing quite so magical as a bit of warm sand underfoot in January... And the coastal walks are a great pleasure. We often walked all the way to the Riviera hotel on a Sunday, had a buffet lunch there ( the views are amazing, the staff is friendly and we like the entertainment). Its a 2km walk so the walk back aids the digestion :) We love the small Marian Sanctuary in Mellieha and will generally tackle the uphill climb to the village by only takes 20minutes but it certainly keeps you fit! Once there a quick visit to the Sanctuary then its off to check out the shops or to the cafe behind the Church for tea or a quick snack. Its central and close to the beach and the sea views from the back are a great bonus. Sea views are very hard to come by and its lovely to look out at the azure blue sea as you're getting dressed in the morning. I love the large sunny balcony that comes with this property; its large enough for eating out and it has pleasant valley views that make it very agreeable. A bonus is the excellent view of fireworks during Mellieha's fiesta season. Its just literally, down the road to reach the beach and it does not suffer from the uphill climbs that so many properties are prone to in this location. It would really spoil my day if I had to huff and puff my way back to some uphill apartment after a hot day at the beach. This apartment is lucky in that regard. Bathroom, bath with shower attachment. Ensuite shower room with walk in shower. Air conditioners in all bedrooms. Ceiling fans in all rooms and the apartment enjoys a great through breeze. Automatic washing machine is in the bathroom. wifi available but please bring your own computer or laptop. free wifi in kitchen, living & dining room and in one bedroom but in two of the bedrooms reception is unavailable. Walk in elevator, no steps. Two large sofas seat 7 persons of average build. Our water is safe to drink but the taste may not be to your liking! So I leave a few bottles of bottled water. Tea, coffee, sugar is always available in the apartment. Dining area adjoins the kitchen and living room. Ceiling fans and plenty of space. Two tables available. Large seats 6 persons, small table seats 4 persons. Beach toys for young children. Family friendly videos, around 30. Feel free to get your own or rent from Mellieha village. Concrete ramp from street to apartment entrance. Lift to apartment and no stairs inside the apartment. Plus, one bathroom is a walk in room and shower. The apartment is ideally located and provides a range of services and activities to suit most budgets. Great sandy beach and coastal area makes it ideal for low budget outings. Mini markets, bakery and greengrocers all within 1km. For youngsters, there is Popeye village, swings 'n' roundabouts , water park, bowling alley, banana boat rides all within 1km. Several restaurants can b found in the vicinity from low to mid cost to high.If you're looking to be pampered, 2 spas offer a relaxing range of services within a 1-3km journey. For teenagers there is horse riding (reservation required), scuba diving (padi certified schools), water ski-ing, night cruise, excursions to Gozo or Commino, Hop On Hop Off tours to all parts of the island. Let me know where your interests lie and I will be happy to send you an information package. Great location and everything we could possibly need in the apartment. Public transport right outside the door, plus an easy walk to the beach. Wonderful! Everything relating to our stay worked perfectly. Sheila was very responsive to all our questions in advance, including advising us on local taxi firms and provided very detailed instructions relating to the apartment - which was much appreciated. The apartment was large, very clean, with great views of both the sea and the hill behind. This apartment is very clean, has everything you need and is close to amenities. There are several good restaurants only metres away from the front door. The beach is a very short walk away too. The main village is only a short bus ride away where there are more great restaurants and bars. Thank you! So pleased you enjoyed the accomodation! We enjoyed a wonderful stay at this property. Sheila and Dave are very kind and helpful, responding immediately to any questions we had. The views from the bedrooms and the living room are beautiful. The flat is clean and well kept. We were minutes away from bus stops, nice restaurants and a lovely beach. If you enjoy walking there are many fine hikes and walks close by. I highly recommend this property. Thank you! I'm happy you had a comfortable stay! Upon arriving Sheila was very helpful and showed us around and gave a some helpful tips around the area. The apartment was well and truly equipped with everything our family needed. Very close to the beach which is a bonus for us and the kids, and a little supermarket which is close by. Thank you for giving our holiday a great and memorable start. We will not hesitate to stay here again in future! We bezochten dit appartement 5 dagen. Het appartement is ruim en van alle gemakken voorzien. De sleuteloverdracht verliep soepel ondanks onze aankomst rond middernacht. Vlakbij het appartement zijn voldoende eetgelegenheden en één kleine supermarkt is binnen handbereik. Buslijn stoppen voor de deur en vanaf daar ben je zo in Gozo. Met één huurauto hebben wel het eiland verkend. We hebben één leuke vakantie gehad. 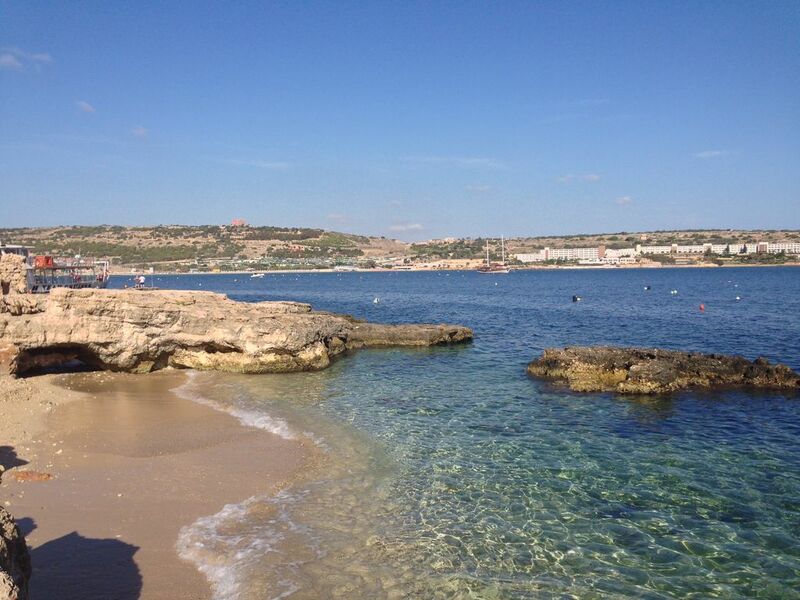 Malta's largest sandy beach is just 400metres from my apartment. In winter the area has a network of coastal paths ideal for country walks in bracing sea air and for picnics in sunny coves. In summer Ghadira Bay is a free beach with lots of beach services. For those who wish to try diving in our beautiful waters, there are two Padi certified snorkelling school 100 & 300metres. Rural Mellieha village 800metres with a Catholic church and a stunning Sanctuary Cave Church. Constructed late in the 16th century, the Sanctuary is dedicated to the Blessed Virgin and includes a beautiful Byzantine style fresco. If you see just one historical building during your stay, this should be it ! I do recommend Ta'Peters restaurant up in Mellieha for good food at reasonable prices. For a breathtaking view, try the cafe behind the Church and for young children the cafe adjoins a public playground. Popeye Village is an unforgettable adventure outing for younger children, situated some 1km from the apartment and easily reached by walk or public bus. Bus service to Valletta is available 7am-10pm with bus stops just 100metres from the apartment. Free street parking in front of the apartment. Our winters are mild and most days are sunny which makes for great winter breaks. Italian is also widely spoken and local TV includes all Italian stations. major tourist attractions and areas. Pastizzi are pasties with a filling of mushy peas or local goats cheese. Outlets are found in every village, often along the main road of the village. Imqaret are fried date cakes, very popular on special occasions. A seller of long standing can be found near the bus terminus, just before the main entrance to Valletta. Strawberries are also grown on a large scale in Malta and give rise to several April fruit festivals in the village of Mgarr, 9km from Mellieha. Our grandparents also considered snails to be a part of their diet, but it is a delicacy that has not retained many supporters. Snails, cooked and seasoned, can generally be found in food fairs during the summer months but are difficult to find on restaurant menus. Malta also produces its own range of fine wines. Price is a good indication of taste. The biggest producers are Marsovin Winery , Meridiana Wines and Delicata Wines. Two of the best wines are Isis, a white Chardonnay and Antonin Noir, a fruity well bodied red. For a summer platter of hams and cheeses, try our locally produced goat's cheeslets which come in a choice of plain, peppered and seasoned. Or add some local olive oil to your summer salad ...... famous chef Jamie Oliver came to Gozo to have a sample of our olive oil just last year (http://www.jamieoliver.com/news-and-blogs/maltese-olive-oil-worlds-best/) :) ..... why don't you ?